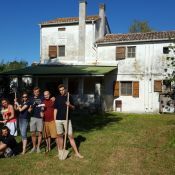 We take care of the holiday house the Bevano and aim to share our values like sharing, friendship, creativity, life in a group. Our next project is to rebuilt the chimney. J'applaudis vos efforts et votre projet et me réjouis de découvrir un jour le Bevano. Bravo à tous et courage pour les travaux ! You receive a custom postcard signed by the president. The cooperative offers you one night for your next stay at the Bevano. Please announce it at the reservation. The cooperative offers you a pot of honey from the Marches region. The producer lives just nextdoor. The cooperative offers you two nights for your next stay at the Bevano. Please announce it at the reservation. A mobile made with wooden pieces, glass, perls, shells collected mostly on the beach or around the House. The cooperative offers you four nights for your next stay at the Bevano. Please announce it at the reservation. The cooperative offers one ticket for the supporting dinner planned between 2018/2019. The president would be proud to offer you a coffe and tell you more about the history of the Bevano and the projects that we have. The cooperative offers you seven nights for your next stay at the Bevano. Please announce it at the reservation. The cooperative offers two tickets for the supporting dinner planned between 2018/2019. The cooperative offers you two tickets for the supporting dinner planned between 2018/2019 and four nights for your next stay at the Bevano. Please announce it at the reservation. The cooperative offers you ten nights for your next stay at the Bevano. Please announce it at the reservation. Bevano for you + friends! Three nights in the Bevano for just you and your friends. Max 15 people. Please announce it at the reservation.